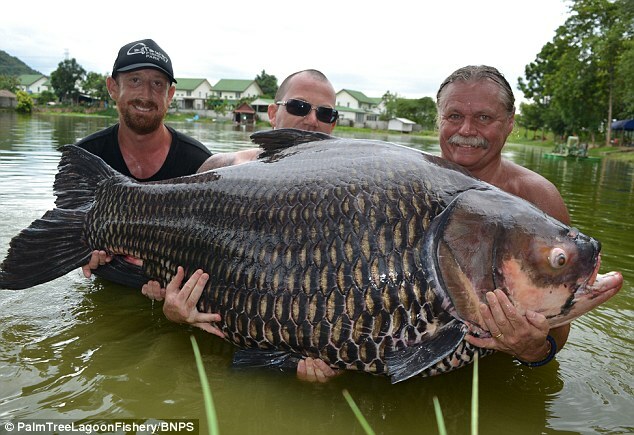 The world's biggest carp was landed in Thailand just recently, when Tim Webb captured a 222 lb Siamese carp. Asia is known for it's huge fish, with Siamese carp growing much bigger than their European counterparts. The current world record carp stands at 105lb, captured at Euro Aqua in Hungary. That Asian carp can grow much bigger was proven again with a new record 222lb Siamese carp landed in Thailand, breaking the previous Siamese carp record with more than 70lb. The Daily Mail reports that Tim Webb from Crawley, West Sussex, who owns the 3.5 acre Palm Tree Lagoon fishery in Thailand, needed 90 minutes to reel in his record catch. The former record weight was 150lb and dated from January when Andy Harman from the UK took in a 150lb Siamese carp.